The Cedar House Restaurant prides itself on providing guests with a true fine dining experience. Indulge your taste buds in cuisine that celebrates sustainably sourced fish, natural meats and some of BC’s finest wines. This upscale mountain restaurant offers a farm to table concept in a converted cedar house offering you an experience that is fine dining meets home comforts. The custom built patios offer striking mounting views and a perfect place to watch the sun set while enjoying your beverage of choice. The Cedar House Restaurant décor celebrates the rustic mountain surroundings with wood trim and heavy timbers, while the exterior provides stone pathways and manicured gardens perfect for pre or post fine dining dinner strolls. The cracking fireplace adds to the après ski ambiance. The restaurant boasts a reputation for a truly remarkable dining experience as shown by the many awards and accolades including: #1Restaurant in Golden on TripAdvisor and Top 50 places to eat in Canada – National Restaurant Guide. Please give us a call at 250-344-4679 and we will save you a table! The Cedar House Restaurant is open Thursday to Sunday for dinner starting at 5 pm. Please Note: The Restaurant will be closed Monday April 14th – Wednesday May 17th. We will be reopening Thursday May 18th with a new spring menu. Starting Wednesday June 5th – June 23rd, we are open Wednesday to Sunday. For the summer months, June 24th – September 21st, we are open for dinner 7 days per week. 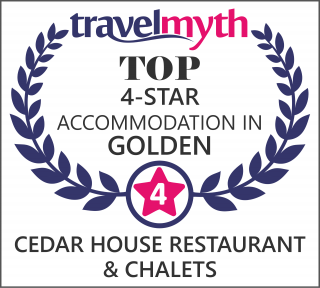 Are available for both the Cedar House Restaurant & Cedar House Chalets. Contact directly to purchase. Call or email for details.